Eggplant anyone???? Not only does this make a beautiful presentation but it’s tasty, tasty, tasty. This recipe comes from Yotam Ottolenghi’s Plenty. Baby Lady bought me this cookbook a while back and I had yet to try anything in it. For those of you unfamiliar with Yotam Ottolenghi, he is an Israeli-born chef, cookbook author and food writer (he writes a weekly column for The Guardian) and restauranteur with his eponymous restaurant Ottolenghi in London (Islington) and NOPI (Soho), along with several gourmet delis. 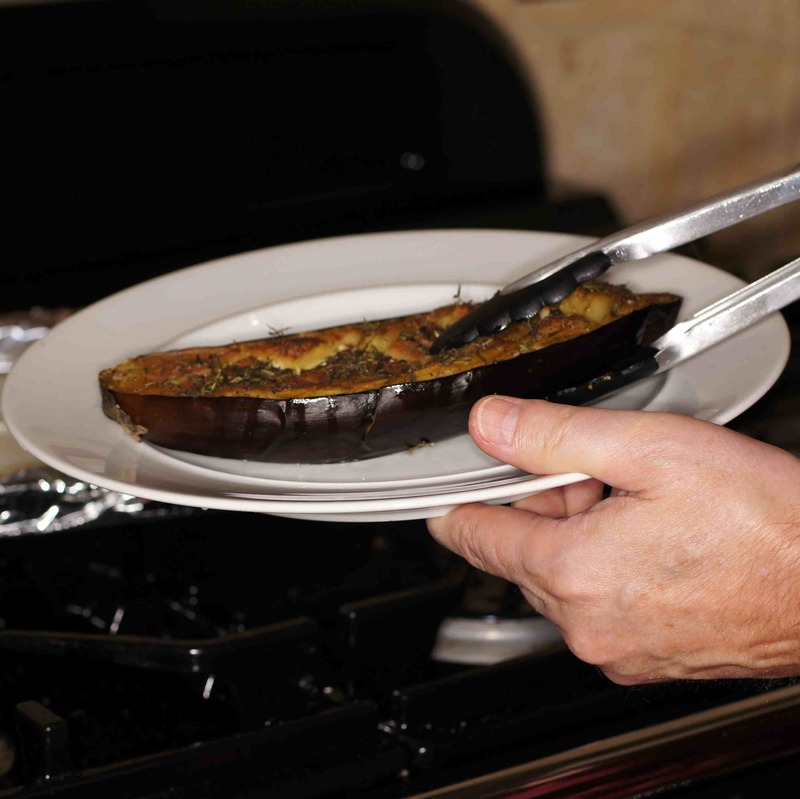 Although he is a lover of meat, he is considered the champion of vegetables with a cooking style that is distinctly Middle Eastern with a western twist. Plenty is his vegetarian cookbook. Baby Lady bought me Plenty because we like veggies, a lot. We also like Middle Eastern cuisine so it seemed like a perfect fit. It’s quite a cookbook with great photos and easy to follow recipes. This dish is the cover photo for Plenty. Once you see the cover you have to find the recipe because it looks sooo good. In fact, it looked so good I had to try it. It took a while but we finally did and it’s absolutely delicious. 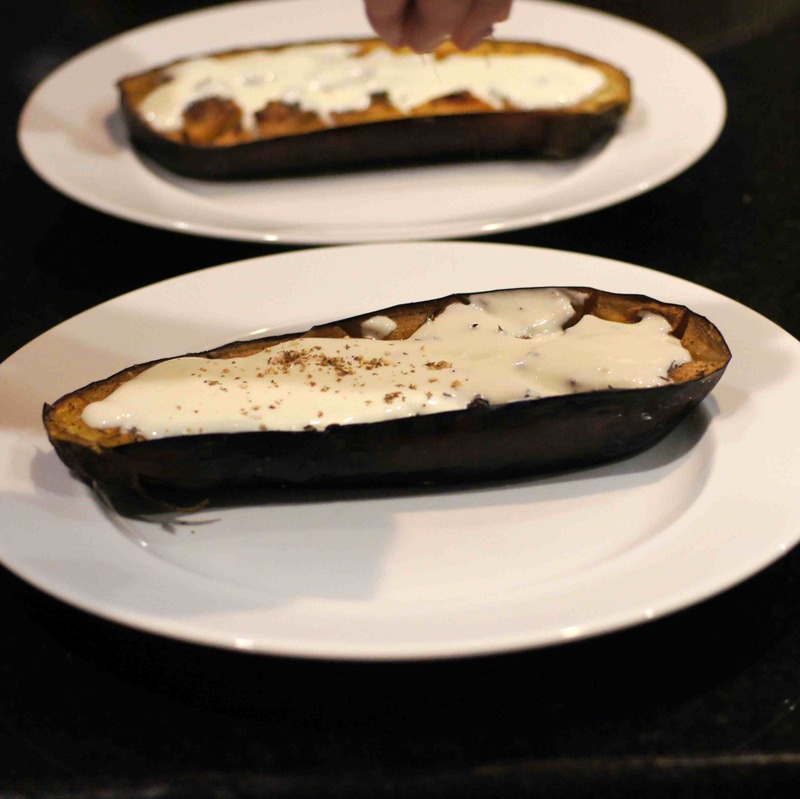 If you like eggplant, this is a dish you definitely need to try. 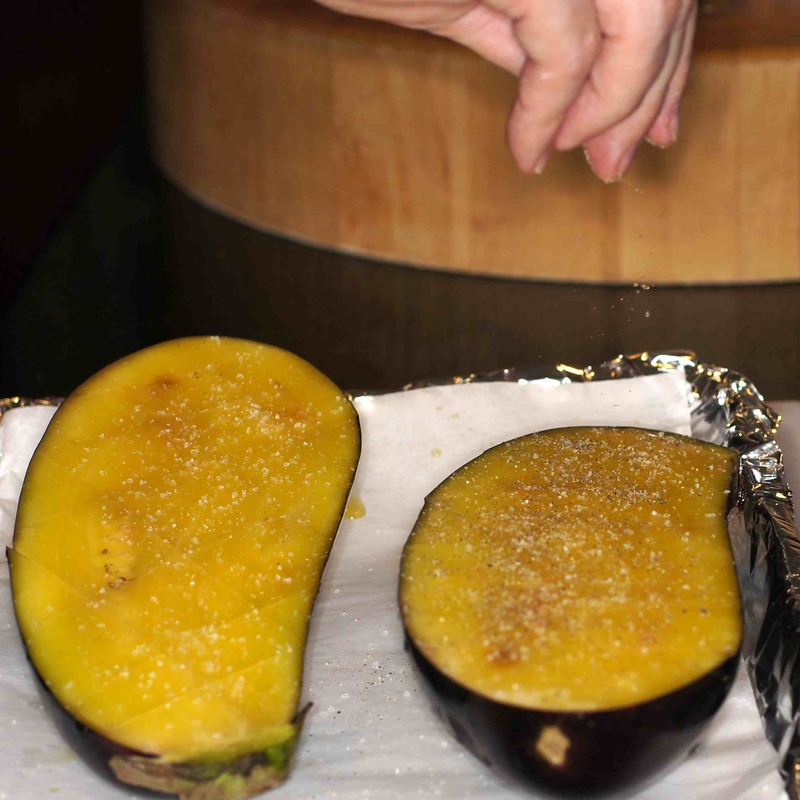 He uses 2 whole aubergine eggplants in his recipe and serves it as an appetizer. Baby Lady and I cut the recipe in half and had it as a light Saturday brunch. 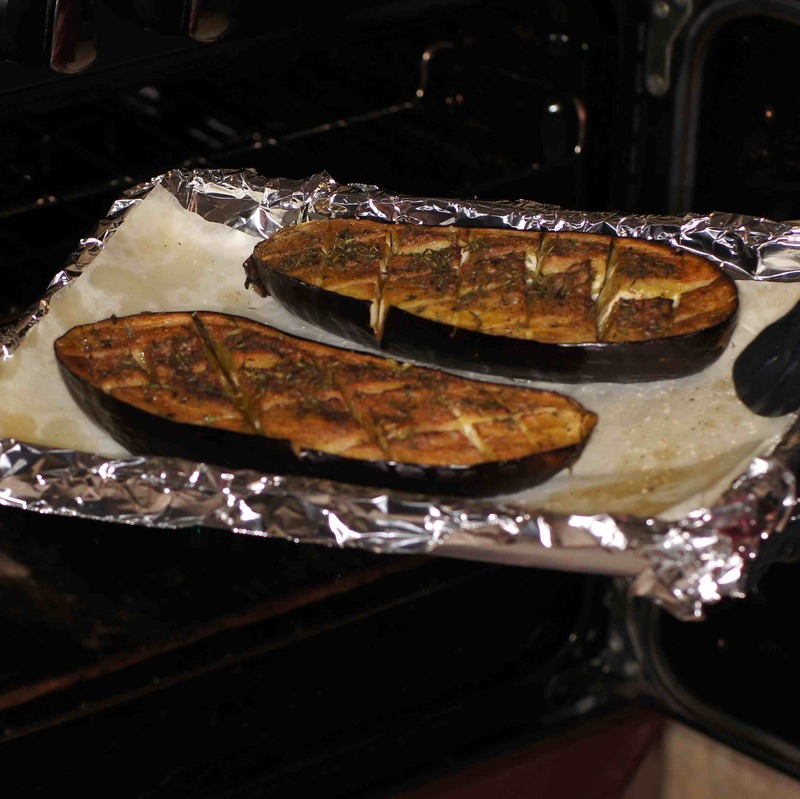 The eggplant is full of flavor and so soft and creamy from the roasting process. The buttermilk sauce adds a touch of tang while the pomegranates add a burst of flavor and textural crunch. It’s perfectly balanced. This is what we did. 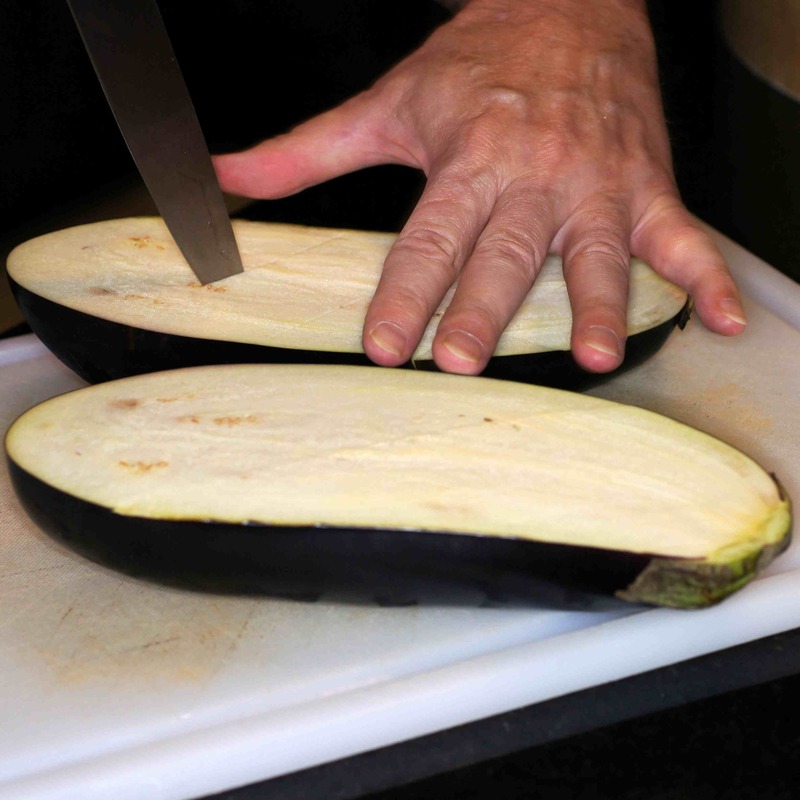 Use a small sharp knife to make three or four parallel incisions in the cut side of each eggplant half, without cutting through to the skin. Repeat at a 45-degree angle to get a diamond-shaped pattern. 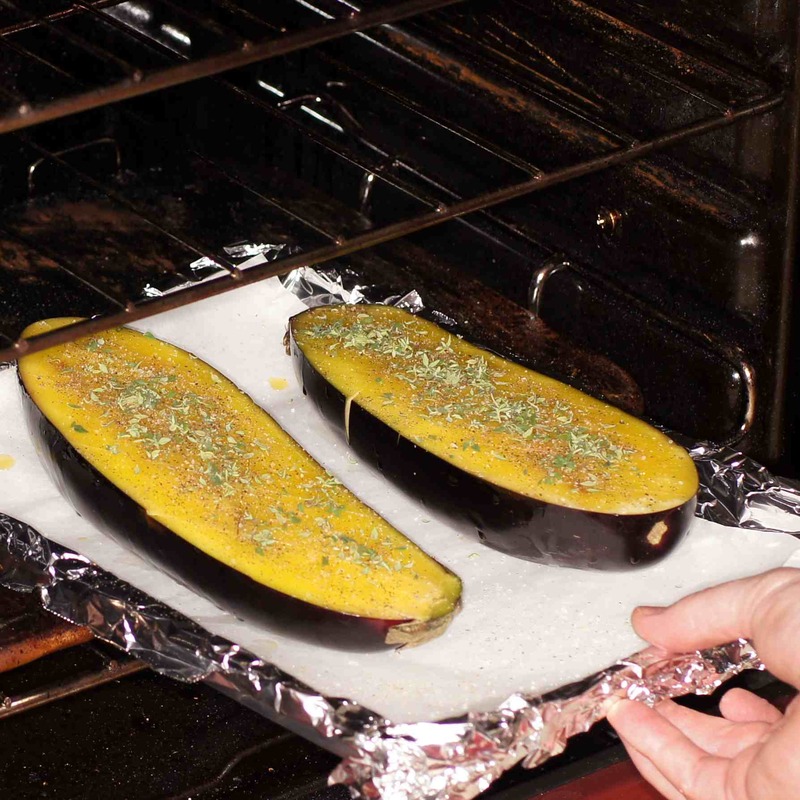 Place the eggplant halves, cut-side up, on a baking sheet lined with parchment paper. 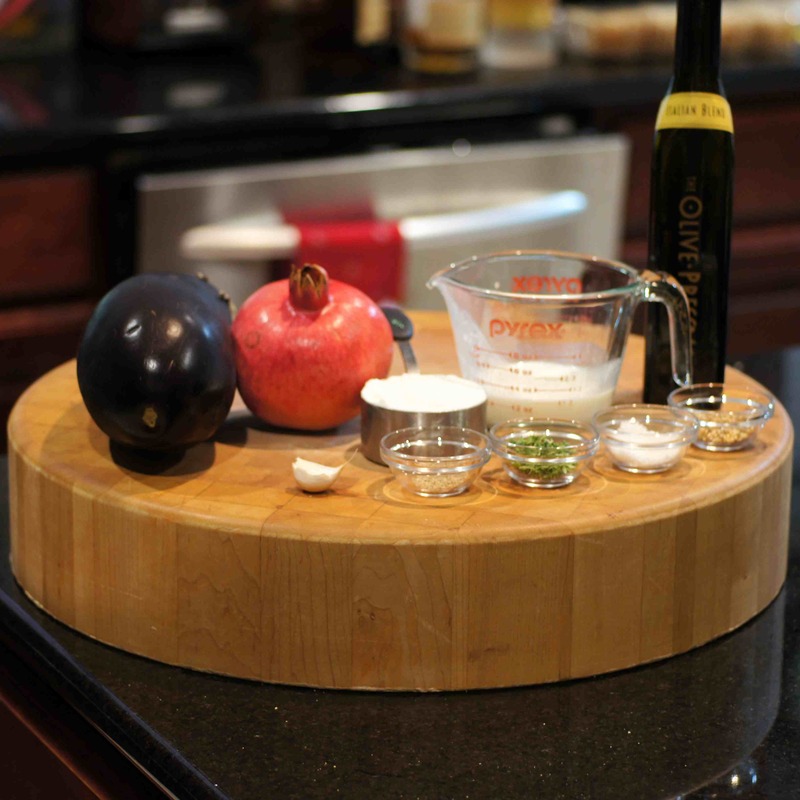 Brush them with olive oil—keep on brushing until all of the oil has been absorbed by the flesh. 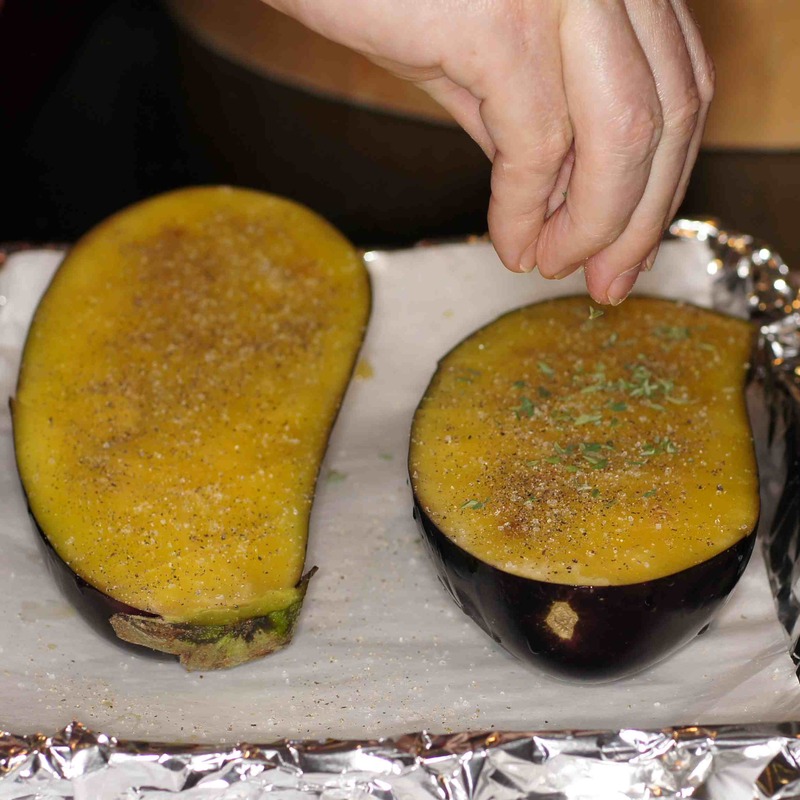 Put in the oven and roast for 35 to 40 minutes, at which point the flesh should be soft, flavorful, and nicely browned. 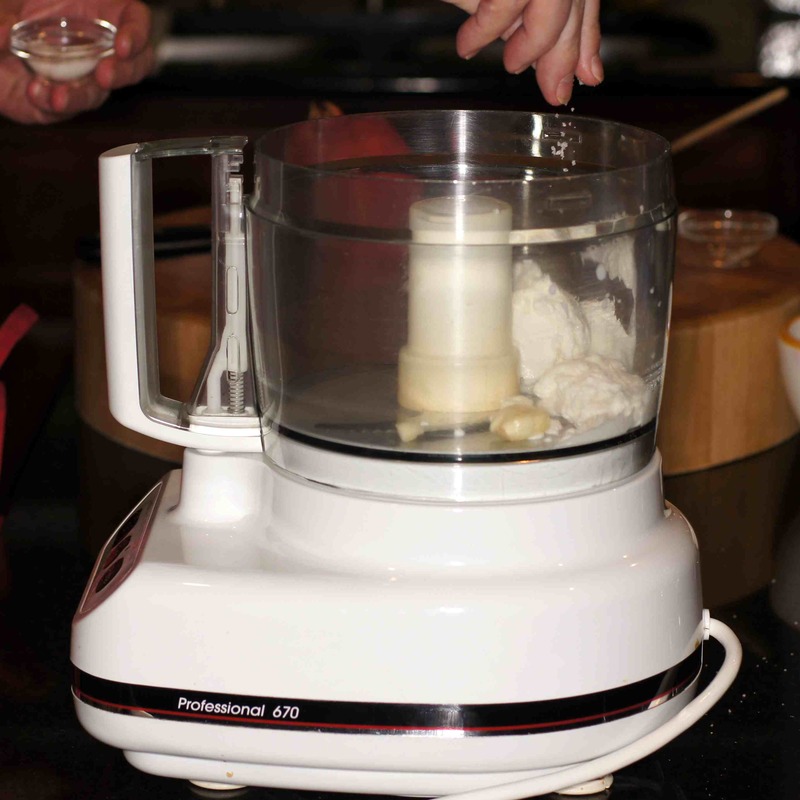 Process until the garlic is minced and while running add the olive oil. Taste for seasoning, then keep cold until needed. Garnish with lemon thyme, a drizzle of olive oil, serve & enjoy. NOTES: * Za’atar is a spice blend in the Middle East that consists of dried herbs, sesame seeds, and sumac. Oftentimes, salt is added, as well. It is a spice blend that goes back to the 13th century, at least. Much like other spice blends, what herbs are used and how all those ingredients are proportioned vary from culture to culture, region to region and family to family. In much of the Middle East, za’atar recipes are closely guarded secrets. In Jordan, the za’atar has a red appearance because it’s heavy on the sumac. Lebanese za’atar may have dried orange zest. Israeli za’atar often includes dried dill. I generally use a very basic za’atar recipe. 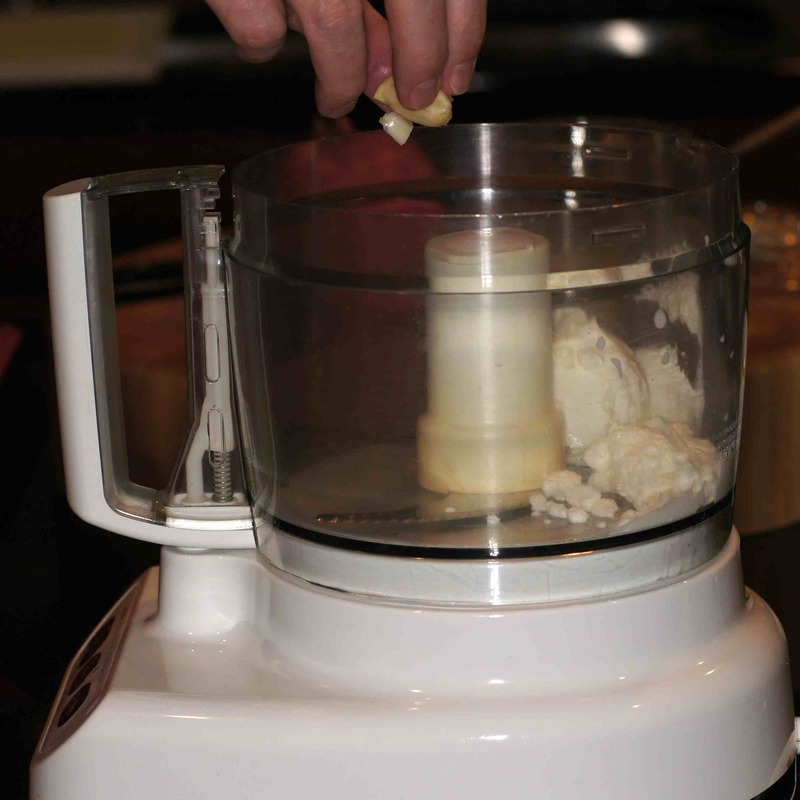 Using a mortar and pestle, grind the spices into a fine powder Store in a sealed a jar. It will keep frozen for several months. 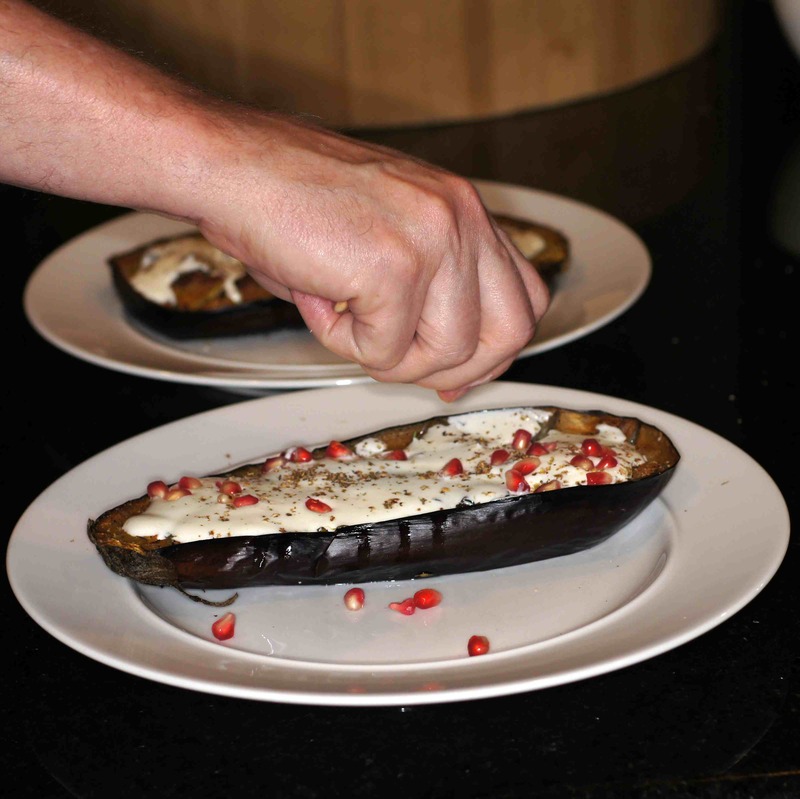 Eggplant and pomegranate seeds, such an interesting combination! I doubt my picky family would even attempt to try this if I made. However, I have a question. Since you have a pomegranate tree, you must have seeded quite a few of them. My first attempt at seeding one resulted in a pink mess splattered all over the counter tops and even the upper counter doors! 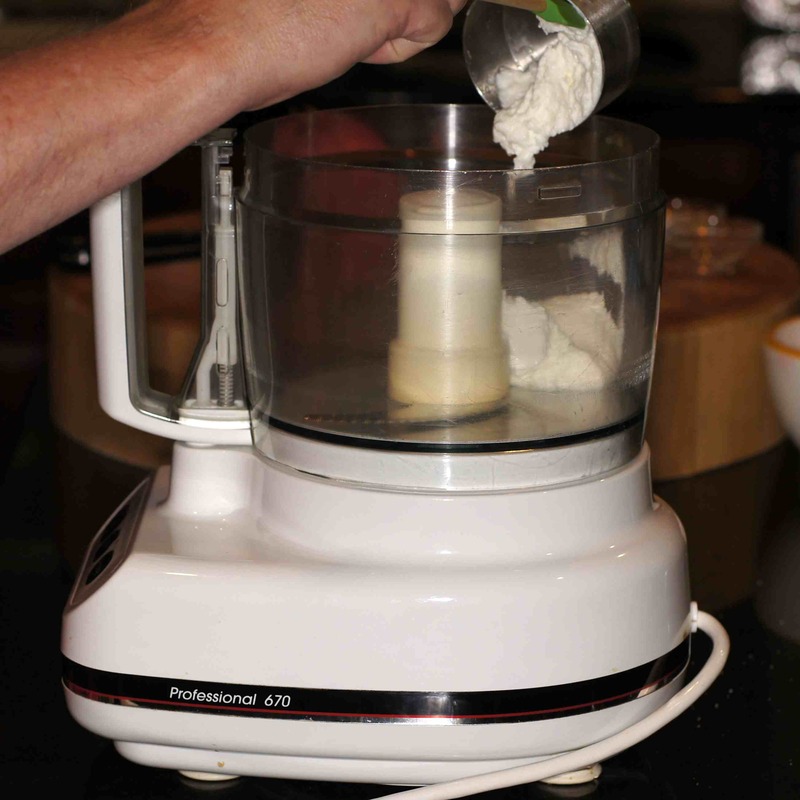 Do you have a mess-free trick? Hi, Kathryn. Sorry your family won’t try this dish. It is unbelievably tasty. 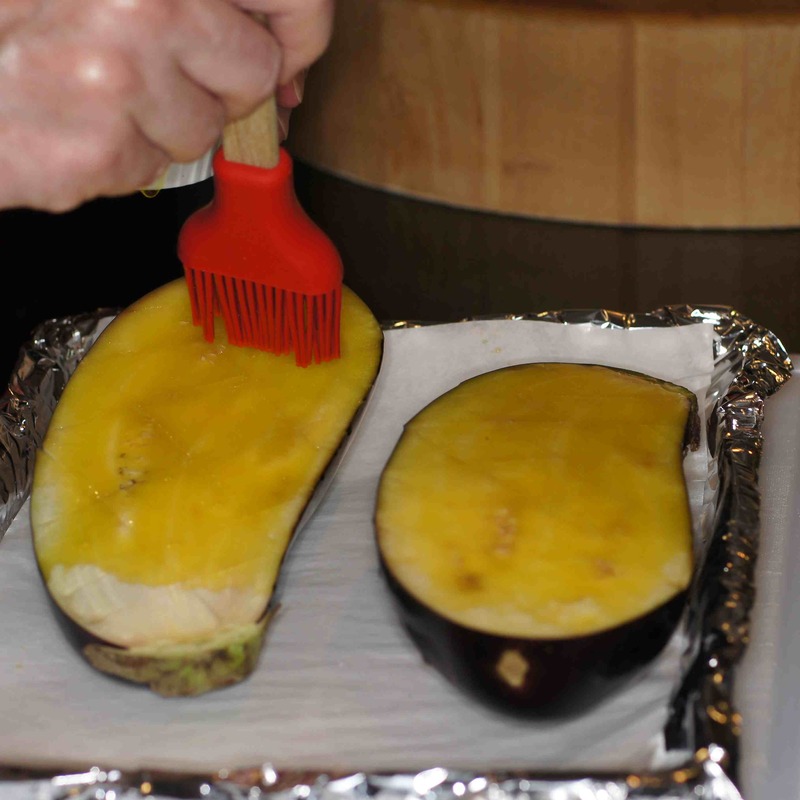 The eggplant is very soft and creamy from the roasting process. 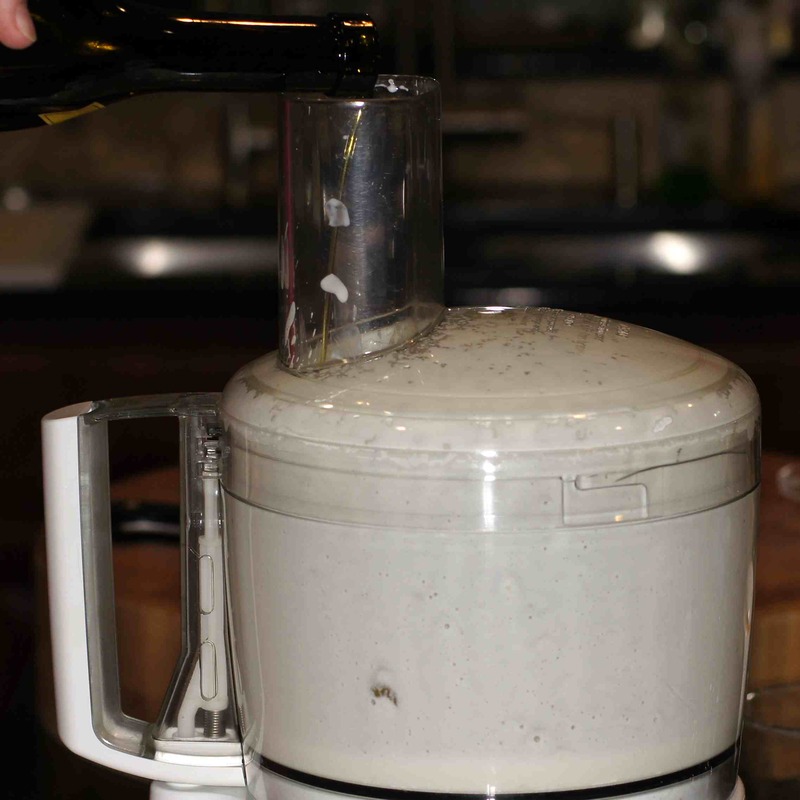 The olive oil is absorbed into the flesh and adds a nice flavor. 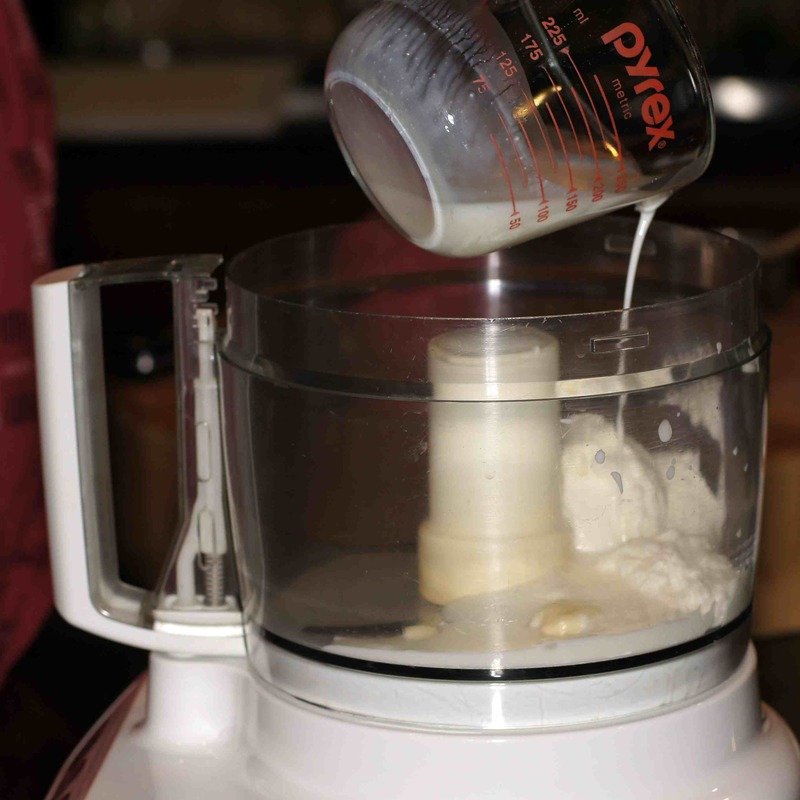 The buttermilk sauce is cool, refreshing with just a touch of tartness. It’s really nice and I doubt your family would know it’s eggplant if it weren’t for being in the shell. 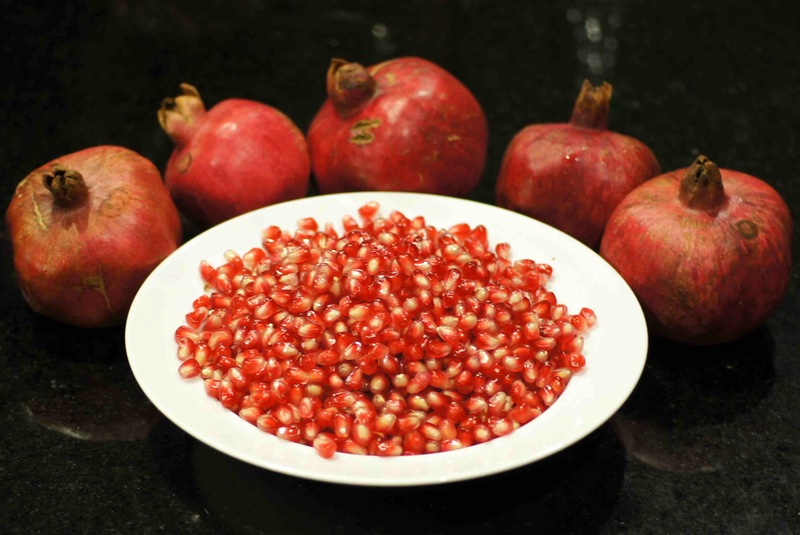 As for pomegranate seeds, we pull off the remnant of the flower end and score the outer peel all the way around. This allows you to pull apart the pomegranate in half. 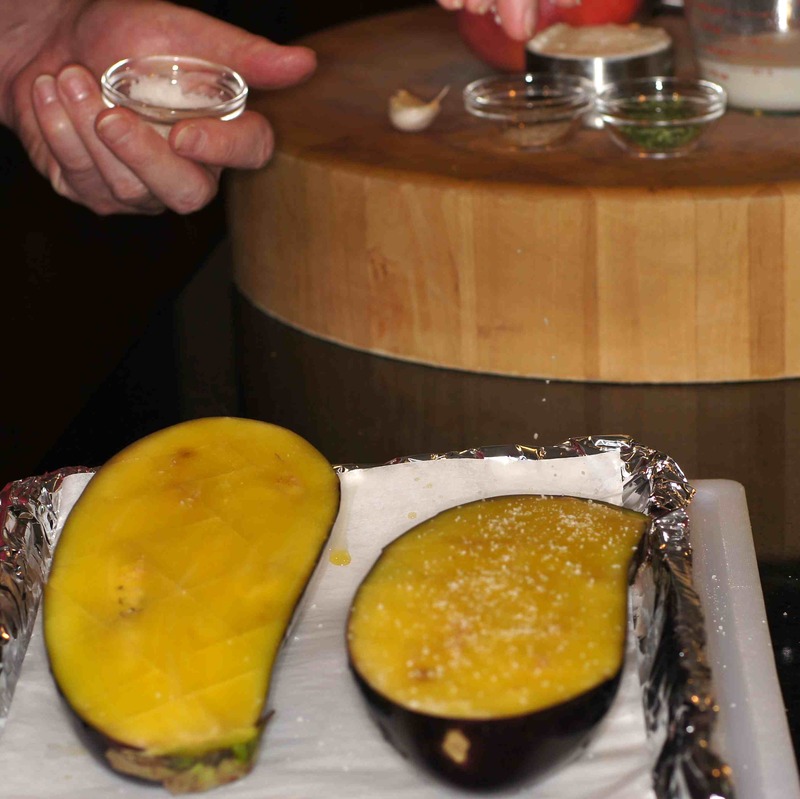 Then, we separate the arils from the pith. We have had a lot of practice so it’s not too messy but if you don’t want splatter, put the pomegranate in a bowl of water when you separate the arils. The arils will sink and the pith floats. Ahh, thank you Richard. I had not thought of putting it in a bowl of water. Many thanks! Hi, Jen. Thanks for the nice compliment. We really liked this and will definitely be making it again. OK, am somewhat frustrated! Bought ‘Jerusalem’ about two months ago and am ‘working’ steadily thru’ that one! [Not one failure so far!]. That does not mean I have ‘Plenty’ ~ and I am supposedly on a very necessary cookbook buying moratorium!! Hmm!! LOVE eggplant and this looks great . . . have said eggplant just bought and all bar the very necessary pomegranate! One brain has to be put in gear . . . thank you and shall advise of progress 😀 !! Hi, Eha. Sorry to hear about the cookbook moratorium. That must be very difficult. I have no idea what you could substitute for the pomegranate so I’ll look forward to hearing about what you do. This does indeed look great, Richard. Thanks for explaining who Ottolenghi is — when he was mentioned before on other blogs he was mentioned as someone everyone knows (and I was too lazy to google him). This looks amazing! I love how you incorporated pomegranate seeds; yum!! What a contrast of flavours. Looks like a bold dish. 🙂 But looks like it really works. Hi, Virginia. Thanks for the nice compliment. 🙂 Actually, it’s not a very bold dish, just a downright good dish. 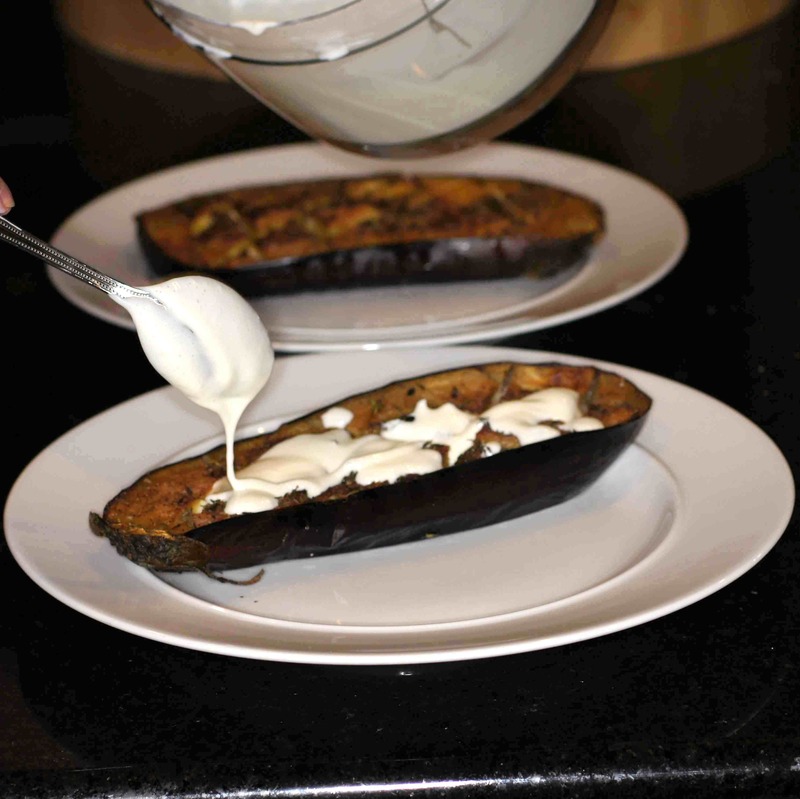 The eggplant is very subtle, smooth and creamy. 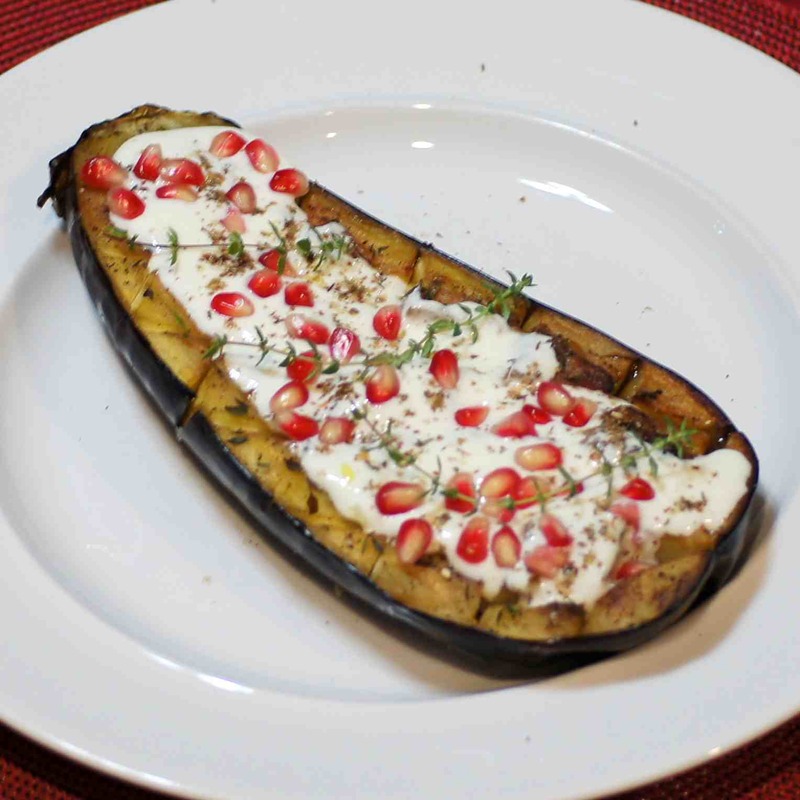 You get the savoriness from the oil, eggplant and thyme, a tanginess from the buttermilk sauce and a burst of flavor and texture from the pomegranates. Thanks, Francesca; however, the recipe is not mine in any way, shape or form. This is direct from the cookbook Plenty without any alteration. I generally don’t enter food contests but I would never enter a food contest on someone else’s recipe. I, too, am an eggplant lover and this dish sounds wonderful, Richard. I’ve only tried a couple of Ottolenghi’s recipes, so far, and have enjoyed each one. With that buttermilk/yogurt sauce and its pomegranate seeds, I’m sure to like this one, too. Thanks for sharing. Thanks, John. This was the first recipe I have tried by Ottolenghi. I will definitely be trying more of them. This was so delightful in ease of preparation, presentation and taste.